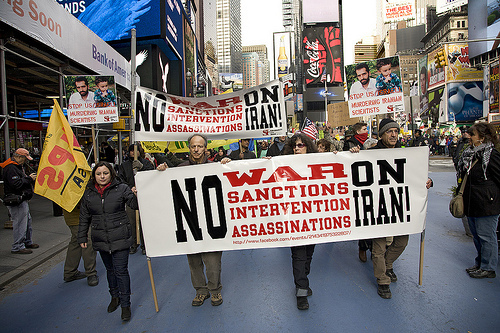 Under new American policy toward Iran, no one can send money or American goods to anyone living in the United States. This brings up the important question of why the Iranian people are purposely put in the crossfire of the political bout between Iran and the U.S., when clearly the U.S. hopes to exert burden on the government to shut down its nuclear program, and not the people who have no control over it. It is believed that there is just as many Iranians living inside of Iran as there is outside of it, making it one of the largest diaspora communities in the world. Iranians fled the country after the 1979 Islamic Revolution that led to the creation of the Islamic Republic, and continue to leave due to limited rights, and government oppression over the people. Iran is believed to be facing a massive “brain drain”, because many Iranian students feel that they can have a better life outside of Iran, and many immigrate to the United States to receive a good education. However, because of the economic sanctions, it is becoming increasingly difficult for Iranians to immigrate to the U.S. because the U.S. is handing out less and less student visas to Iranian students every year. In particular, the U.S. has particularly restricted Iranian students hoping to gain a degree in engineering from entering the states in its latest sanction bill passed in August. Iranians constitute a large amount of students studying engineering in the United States, and considering that the U.S. is far behind in science and technology compared to other countries, this undoubtedly will hurt the U.S. in the long-run since it hasn’t been able to attract its own people to entering these career paths. Many Iranians, although obtaining student visas and studying in the U.S., aspire to stay here in order to escape what has increasingly been an oppressive government in Iran, and lack of freedom. In addition, because of the economic sanctions many Iranians here in the U.S. are unable to pay for their education in the United States. Because the Rial has declined so much, it is not worth it for Iranian families to send money to their children in the States because the Rial is worth almost nothing compared to the Dollar now. Essentially, Iranians would be losing money converting the Rial to the Dollar, so for many it is not even worth it. Iranian students are forced to find money elsewhere, which, as immigrants merely on a student visa, is difficult because they are without a work permit. I remember when I worked in the Portland State University’s Middle East Studies Department during the Libyan uprising, a group of Libyan students barged into the Middle-Eastern student adviser’s office, frantically trying to figure out how to pay for their education now that Libya was under a civil war and the government was no longer providing aid to Libyan nationals studying abroad, nor could their parents send them money because of the conflict. I have no doubt that Iranian students face the same issues the Libyans did last year. My friend from Iran talks to his Mom in Iran everyday, and everyday he relays stories to me about the sanctions in Iran and how they’re not only destroying the country, but the Iranian people. It is impossible to impose economic sanctions without hurting innocent civilians, and when living in a world that is increasingly becoming transnational, it should come to no surprise that the sanctions are impacting people living in this very country. After feeling the impact of economic sanctions in my own family–My dad came to the US during the Iran-Iraq War and can’t send money to my grandparents–I’m starting to reflect back on history at all the immigrant groups in the US impacted by politics. Iraqi and Cuban immigrants are the most recent examples. The biggest impact the US economic sanctions on Iran has on the Iranian immigrant community here in the US is the feeling that they will never be able to return to the same country they left. And the reason why, is because of the twisted policies of the very same country that they live in today. I am so glad you wrote about this! I had no idea how the US’ economic sanctions in Iran affected Iranian students in America. I’m sure it is a cause for much unrest for these students and I could see how that could lead to only the wealthiest of Iranians students being able to study in the US-a possible benefit for American colleges and universities but a serious threat to the diversity, insight, and talent Iranian students bring to our schools. Hopefully this garners enough attention to help support Iranian students as well as for the US to reconsider its policies and consequent impacts on Iranian immigrants in the US.